HOW GOOD ARE THE BOSTON BRUINS? BOSTON, MA -- Eighty-two games have been played. There have been wins and losses. Overtimes and shootouts. Great passes. Great dangles. Great goals. Great saves and now it’s over. The 2018-19 season has come to an end which means playoff hockey is on the horizon in Boston. Predictions have been made with everyone thinking they know who will win the Stanley Cup. We all think we know who how good each team is, but do we? Clearly, the top three contenders for the Cup are Tampa Bay, Calgary, and Boston. Tampa Bay is the clear-cut favorite going into the postseason and why not? The Lightning won a record-tying 62 games and recorded 128 points along the way to winning the President’s Trophy for finishing first overall in the League. They are not only the odds-on favorite to skate into the Stanley Cup Final, but to also win the Stanley Cup. Calgary finished first in the Western Conference with 50 wins and 107 points and many have the Flames reaching the Stanley Cup Final. For the second consecutive year, there is the possibility that Boston and Tampa Bay could meet in the second-round of the playoffs and in many circles, the Bruins are considered the only team that could eliminate the Lightning from this year’s postseason because it is believed Boston is good enough to do so. The Bruins posted the third-best record in the NHL with 49 wins and 107 points. They recorded the second-most amount of wins on home ice with 29 to Tampa’s 32 home wins. Boston gave up 215 goals earning the honor of having the fourth stingiest team defense in the League. Add the 259 goals Coach Bruce Cassidy’s squad scored and the Black and Gold had the third-best plus/minus in the circuit with a plus-44. And to top off a very successful season, Boston’s power play was third from the top after converting on 25.9-percent of its opportunities. For those of you who are statistics junkies, try these on for size. The Bruins took a two-or-more goal lead in 40 games this season and were 34-5-1 in those games including a 21-3-0 record in the 24 games in which they scored the first two goals of a game. Let’s take it one step further, Boston accumulated a 25-0-0 record in games in which it opened a three-goal lead. And let’s not forget the 19-game point streak of 15-0-4 (January 29, 2019 - March 9, 2019). Individually, David Pastrnak led the club with 38 goals. Brad Marchand was the fifth-leading point producer in the National Hockey League with 100 points. Overall, Boston saw five of its players reach the 50-point plateau in Marchand, Pastrnak (81), Patrice Bergeron (79), David Krejci (73), and Torey Krug (53). In the crease, Tuukka Rask (27-13-5) and Jaroslav Halak (22-11-4) won more than 20 games each this season. Halak’s 2.34 goals against average was seventh among League puck stoppers while Rask was 11th at 2.42. Halak was ninth in the NHL with a .927 save percentage. Rask’s save percentage of .912 was 25th among the members of the goaltenders’ union. Together, Rask (4) and Halak (5) combined for nine shutouts this season. Rask also authored a personal 19-game point streak. He went 16-0-3 (December 19, 2018 - March 9, 2019). There is no doubt Rask and Halak give Boston one of the best goaltending tandems in the NHL. Sure, the numbers say this is not only a good club but a very good one, but when you consider that Boston endured 253 man-games lost to injury or illness, it is rather easy to say, no, we do not know how good this team is. The top line of Marchand, Bergeron and Pastrnak is arguably the best trio in hockey and their numbers bear that out, however, the line saw very limited duty together because Bergeron missed 16 games (November 17, 2018 - December 20, 2018) with an upper-body injury. 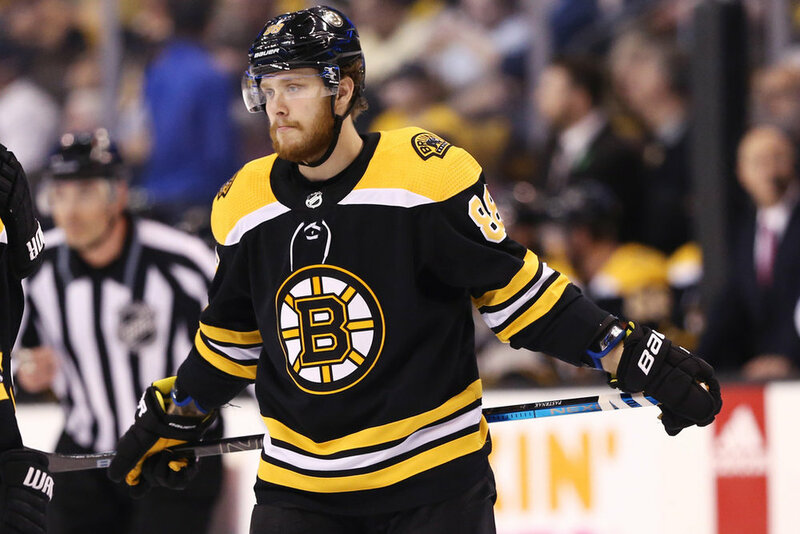 Pastrnak did not play in 16 games (February 12, 2019 - March 16, 2019) due to a left-thumb injury that needed to be surgically repaired. Marchand was forced out of only one game (December 29, 2018) with an upper-body injury. He and Bergeron were also held out of the final two games of the season when it was decided to give some players a rest once Boston had secured home-ice advantage for the first round of the playoffs. On defense, captain Zdeno Chara lost 20 games to knee surgery. His partner and heir-apparent on the blue line, Charlie McAvoy, sat out 19 games with a concussion plus seven more with a lower-body injury. I won’t bore you with the complete list of names and the amount of games they missed, but when you consider that a total of 14 players watched 10 or more games instead of playing in them along and eight others who sat out less than 10 contests, you begin to see that finishing third overall was nothing short of an amazing effort and it shows Boston’s depth when the organization knows it can recall players from the AHL Providence Bruins and they perform admirably enough so that the big club does not miss a beat. Team President Cam Neely is one who is very pleased with what he has seen from the young players who have driven up route I-95 from Providence to suit up in Boston. But again, with the Bruins playing only four games out of the 82-game schedule with a full roster, how good is this team? Cassidy, for one, has been impressed with how the players have performed and reached the upper-echelon of the League. Rask agreed with his coach and believes the Bruins’ best hockey lies ahead of them. “Right from the get-go, we started with so many injuries,” Rask said. “We didn’t have time to sort of feel sorry for ourselves so we just focused on the process and trying to build our game to a place we felt it needed to be and over the course of the year, we did that so I think we feel very, very comfortable whatever guys we have in the lineup. It appears the answer to the question of how good are the Boston Bruins lies in the club’s ability to not only face adversity but have the ability and confidence to look it in the eye and not blink first. While some teams search for the all-important identity of being hard to play against or an identity that is based on speed and skill, the Bruins have achieved all of those but perhaps the most important aspect of their identity is their resiliency. Rask used the word when assessing Boston’s season, as does Bruins GM Don Sweeney. “I think we tested the depth of the organization in all positions and I think that we set out to have a strong tandem in net and that was validated, so both goaltenders receive a lot of credit for that,” Sweeney offered. “I think we struggled to score goals early in the season and were maybe one-line reliant for a period of time. Then the other guys really stepped up and we sort of found an identity with the bottom six (forwards) of our group. They did a really nice job there. And really the resiliency of the group overall and I have to speak to the coaches because they’re a big part of that. To sort of refocus and re-shift the direction of the team at times when you are not, maybe, hitting on all cylinders and finding a way to win is important. And there you have it, resiliency has been the backbone that has seen this group of hockey players become a very good team. One that, as Cassidy said, can play with any team in the League and therefore, one that is good enough to be a Stanley Cup contender. Shawn Hutcheon is the Boston Correspondent for The Fourth Period.